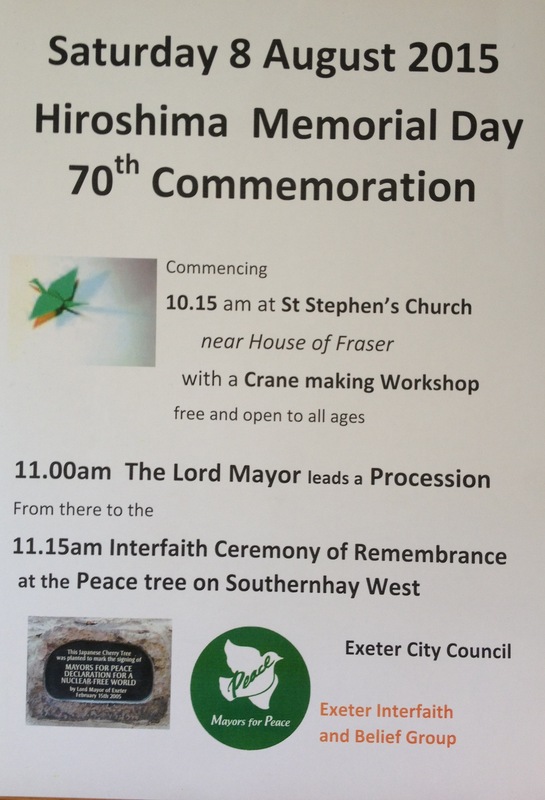 Earlier today Exeter Interfaith and Belief Group along with the Lord Mayor hosted a small receptionat St Stephen’s Church in honour of the 70 Anniversary of the Commemoration of Hiroshima Memorial Day. 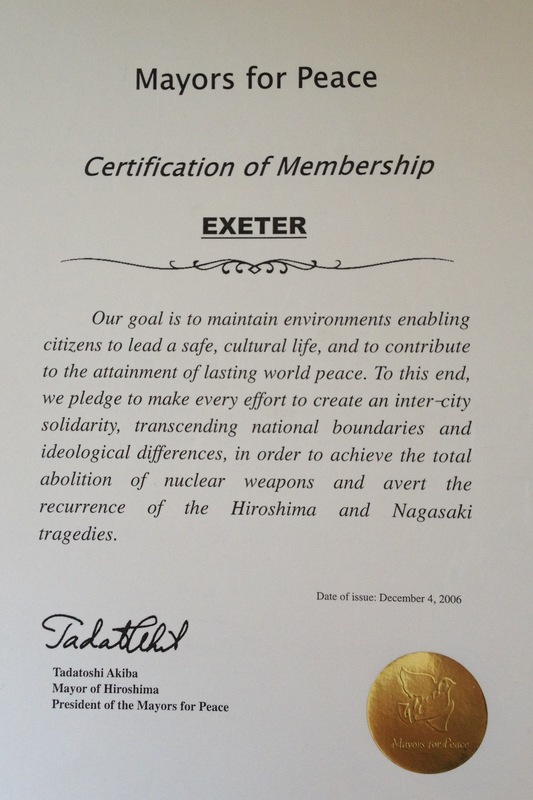 Mayors for Peace was established in 1982 by Hiroshima and Nagasaki with the goal of realizing lasting world peace through inter-city solidarity around the globe promoting the efforts to raise a public consciousness of the need to abolish nuclear weapons. Since May 1991, Mayors for Peace has been registered as an NGO in Special Consultative Status with the United Nations Economic and Social Council . 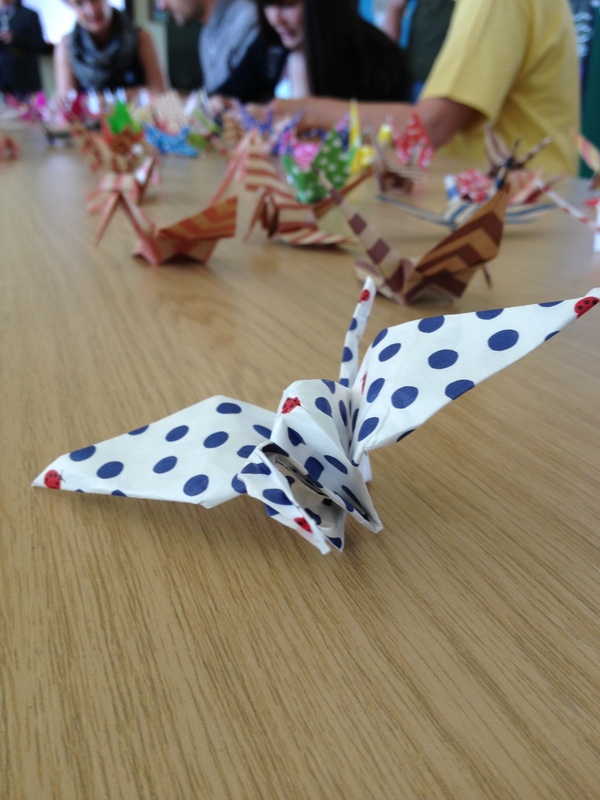 Among the activiities and displays on offer at St Stephen’s was a paper crane making workshop – the story of Sadako Sasaki explains the relationship paper cranes and Hiroshoma. See also: How to fold a paper crane. 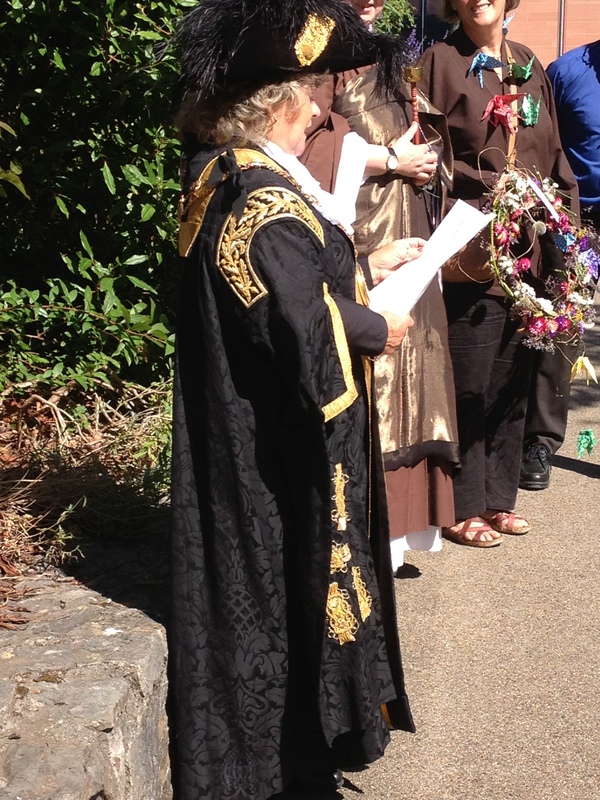 At 10:45, the assembled, behind the Lord Mayor of Exeter and honorary aldeman, processed to the Exeter Peace Tree on Southernay where a small ceremony took place. This year marks the 70th anniversary of the atomic bombings of Hiroshima and Nagasaki. As we face the memorial days, as the Lord Mayor of Exeter, I am honoured to attend this event as part of the international Mayors for Peace movement. I hope that this significant anniversary will serve as a chance for everyone to remember once again the earnest message of the hibakusha – the surviving victims of the atomic bombings of Hiroshima and Nagasaki, a Japanese word that literally translates as “explosion-affected people” – that “no one else should ever suffer as we did” , and also renew our commitment to realize a peaceful world free from nuclear weapons. In these tragedies many died, but many others also lived to see their lives shredded, as their own wounded flesh, fading away slowly, in unbearable suffering from toxic radiation. I want to honor the memory of these sufferers today and sincerely hope that their innocent sacrifice will serve the cause of peace in our world. Today, in the arsenals of the nuclear powers, there are bombs which are 20 megatons and more, that is to say that each one has an explosive power more than 1,000 times than that of the Hiro-shi-ma bomb. Mankind remains under the effect of a perverse and permanent nuclear blackmail. We must break free from it. Everyone has the responsibility to do their part in saving humanity, and not to have to endure the fate that those in Hiroshima and Nagasaki suffered, that we are here to commemorate today. We look forward to the day when every country will be free from nuclear weapons,with all living in peace , prosperity , and tolerance. That is a future legacy to be proud of full of hope and kindness. I hope in marking this anniversary today, that from this will come the change I have outlined. A story generations after us will tell, not with tears of sadness borne out of war or disaster, but tears of joy and hope for humanity from the lesson learned 70 years ago this week. 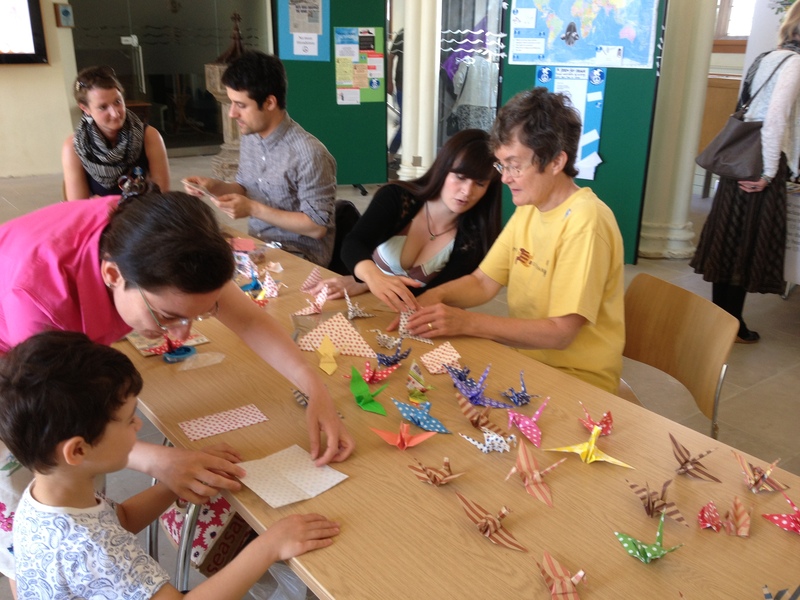 Following the ceremony, the gathering were invited to decorate the Exeter Peace Tree with their paper cranes.